As some of you know, since 2015, I have been traveling on mission trips to Haiti through a nonprofit organization called CHARIS. My family has adoped a Haitian family whom we pray for and support in a small way on a regular basis. This family is currently living in a structure made with tree limbs, corregated metal/plastic and tarps. The mother, Tamata, sleeps on the ground by the entrance to keep thieves out. The rest of the family sleep on the ground inside the home. Each hurricane season, their home is at-risk of being blown down, or is actually destroyed. Each time this happens, Tamata and the children scavenge to locate items to put the home together again. The photo you see with the clothes hanging on the line was taken in August 2017. The photo with Tamata's family, my daughters and I in front of the home was taken in January 2018, when we visited. It looks a little different because their house was knocked down by a huricane between 2017 and the time of our visit this year. I would like to raise $7,000 to build her and the children a home made out of concrete and brick, and also to build a few beds to get them off the ground. I am asking for your help with donations to reach this goal. Hurricane season starts in June and it would be good if this project could be started in April of this year. CHARIS will handle getting the right people to build the home (there is a CHARIS missionary in Haiti most of the year) and at the same time give several Haitians the opportunity to make a small living for awhile. By the way, all the work is done through manual labor. 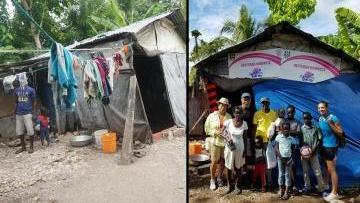 You can learn more about CHARIS by going to this link http://www.charis4haiti.com/. Thank you so much for whatever donation you can provide to the building of Tamata's home, no matter how small. I will keep you updated on the progress. The rest of any funds donated will go to make beds, chairs, a table and other necessities for a home, maybe even a manual pump for pumping water into the house from the public well. Thank all of you for your donations and prayers.